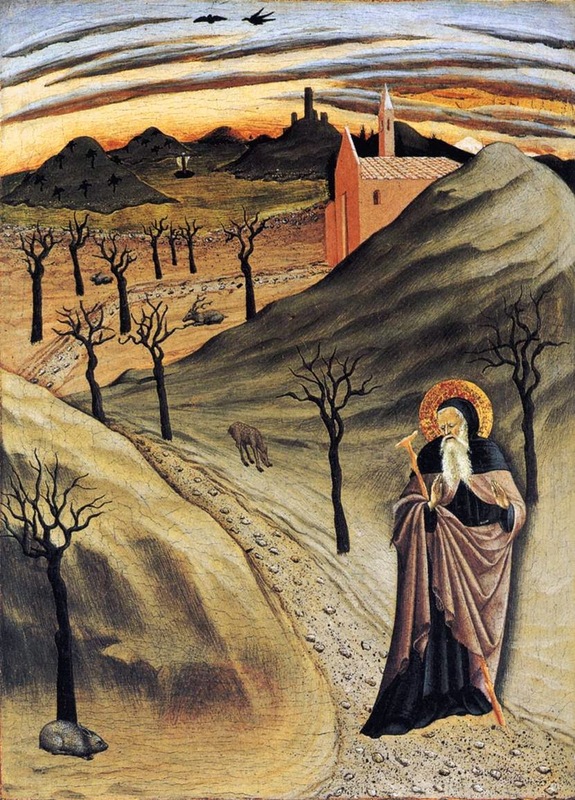 St Anthony was not the first monk or hermit, as Athanasius’ Life makes quite clear; and indeed, the Church honors a saint named Paul with the title “the First Hermit.” Anthony was ninety years old, and had been living as an ascetic for over 70 years, before he first met Paul, shortly before the latter’s death at the age of 113. Paul’s feast day was long kept on January 10th, exactly a week before that of Anthony, to symbolize that he preceded him in the ascetic life. (It was later moved to his date in the Byzantine Rite, January 15.) Anthony also had as a contemporary St Pachomius, who is held in particular honor in the East as the founder of the cenobitic life, and the author of an important monastic rule. Nevertheless, Anthony may rightly be called the Father of Monasticism in the East, as St Benedict is in the West; for it was by his example, more than any other, that so many men and women of his own time and subsequent eras were inspired to embrace the monastic life. This passage and others of a similar vein in Athanasius’ Life have provided artists with the opportunity to indulge their strangest fantasies in depicting the demons who attack Anthony. 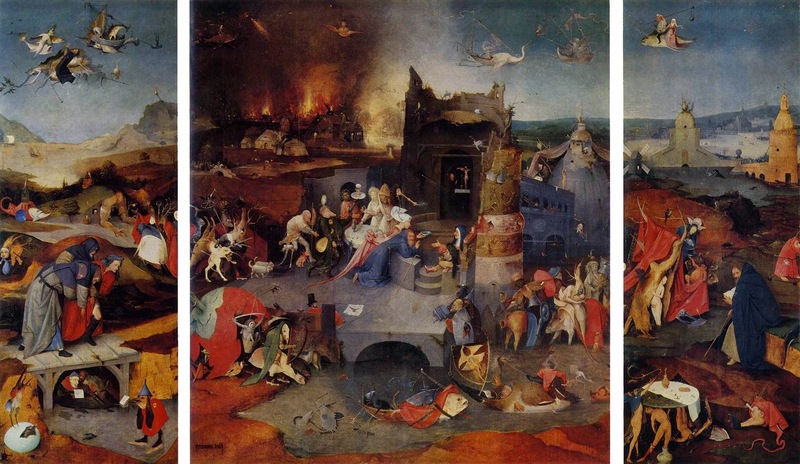 Hieronymus Bosch, not surprisingly, painted a complete triptych on the subject, which was also tackled (also not surprisingly) by Salvador Dalí. 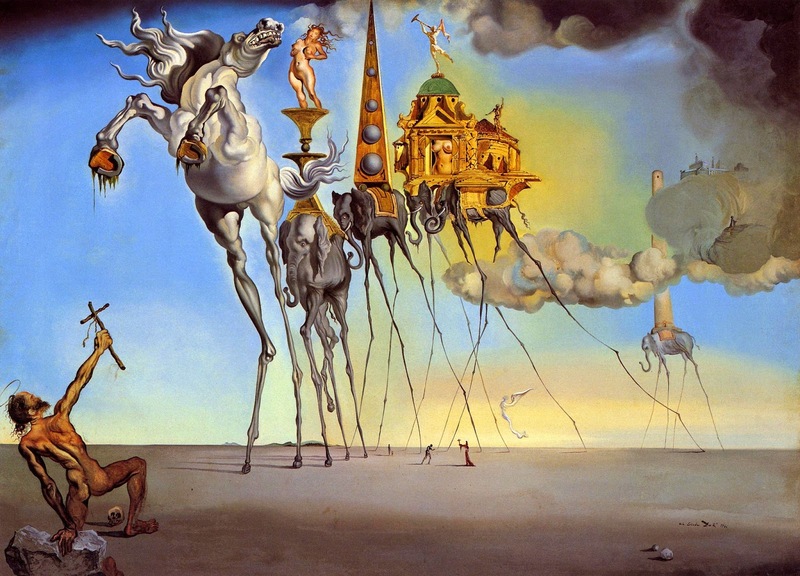 Salvador Dalí, The Temptation of St Anthony, 1946; Royal Museums of the Fine Arts, Brussels, Belgium. The art historian Giorgio Vasari records that Michelangelo, while still a young apprentice in the school of Domenico Ghirlandaio, copied the same subject as a painting from an earlier engraving by the German artist Martin Schongauer. A painting of The Torments of St Anthony now in the Kimball Art Museum in Fort Worth, Texas, is indisputably of the right period and school, but the debate as to whether it is indeed the one done by Michelangelo will probably never be resolved to the satisfaction of all art historians. 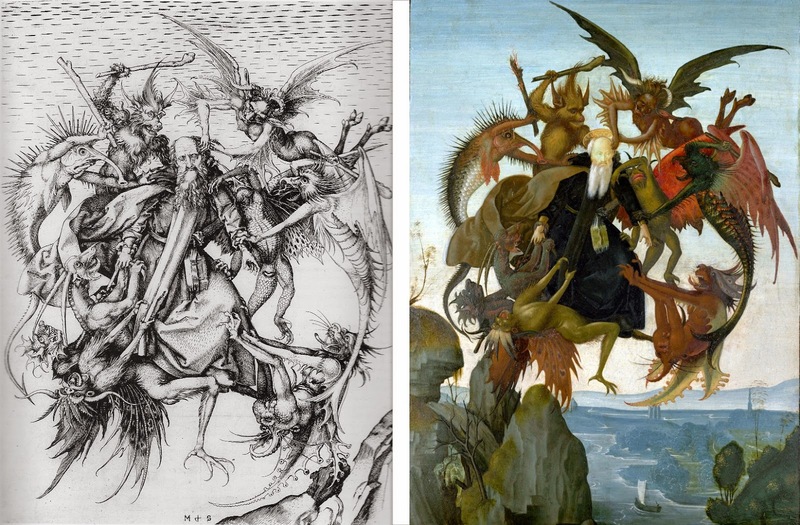 On the left, the original engraving by Martin Schongauer, ca. 1475, now in the Metropolitan Museum of Art in New York City; on the right, the painting attributed to Michelangelo, ca. 1487. Anthony was also tempted on various occasions by lust, by laziness and by riches. The last of these was depicted by the anonymous painter now called the Master of the Osservanza, but the heap of gold lying by the side of road, originally painted in gold leaf, was later scraped off, leaving Anthony to confront a completely non-demonic looking rabbit. 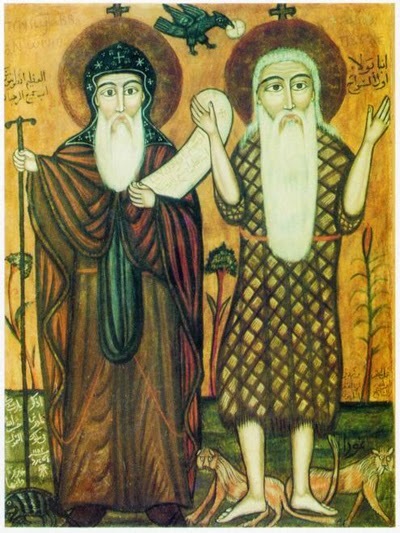 When St Anthony went to visit St Paul the First Hermit, as recorded in the latter’s biography written by St Jerome, they greeted each other by name as they met, though they had never seen each other before. A crow then brought them a full loaf of bread, at which Paul said to Anthony, “for sixty years I have daily received (from the crow) half a loaf of bread; now at thy coming, Christ has doubled the provision for his soldiers.” Perhaps inspired by the similarity between this episode and that of the crows that brought food to the Prophet Elijah (3 Kings 17), the Byzantine Liturgy explicitly compares Anthony to Elijah in the dismissal hymn (apolytikion) of Vespers on his feast day. You imitated the zealous Elias by your life, you followed the Baptist by straight paths, our Father Anthony; you became the founder of the desert and strengthened the whole world by your prayers. And so intercede with Christ God that our souls may be saved. Throughout the Middle Ages, St Anthony was also venerated as the patron Saint against various skin diseases, such as erysipelas and ergotism, some of which are still called “St Anthony’s fire” or “holy fire” in places. A commonly used medieval prayer of his Mass was as follows. Deus, qui concedis obtentu beati Antonii Confessoris tui, morbidum ignem extingui, et membris aegris refrigeria praestari: fac nos, quaesumus, ipsius meritis et precibus, a gehennae incendiis liberatos, integros mente et corpore tibi feliciter presentari. God, who grantest by the protection of Thy blessed Confessor Anthony that the fire of illness be extinguished, and refreshment given to sickly members; we ask that by his merits and prayers, we may be delivered from the fires of hell, and happily presented to the Thee, sound in mind and body.